On 27th February 1966 the Cavern Club closed. Bailiffs went it with the help of a police presence and the 100 or so teenagers who had built impromptu barricades left peacefully. Despite a public campaign to raise money to reopen the club it was sold on 18th April by the court receiver as part of Ray McFall's bankruptcy proceedings. It was bought by a gentleman named Joe Davy who revamped and reopened the famous club. 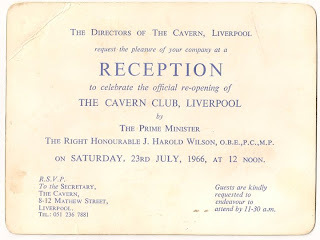 The club reopened officially on 23rd July 1966. The opening ceremony took place at noon and there was a power failure during it! 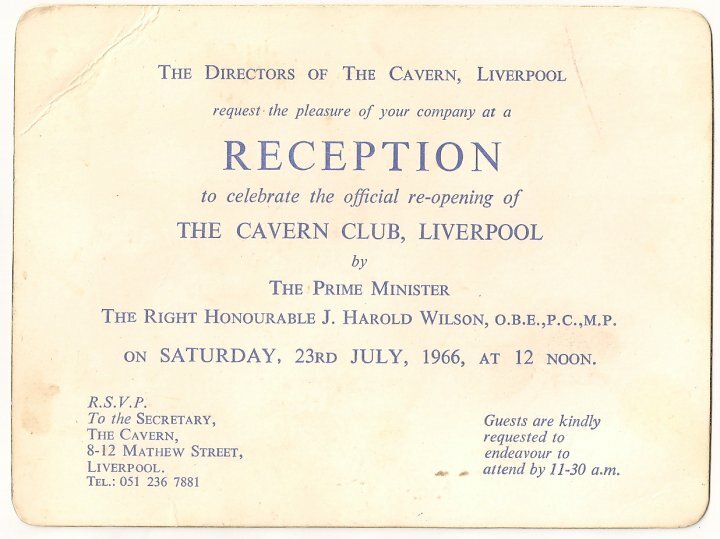 Harold Wilson officially reopened the club and the ceremony was attended by, among several others, Bessie Braddock MP, Ken Dodd, Billy J Kramer, The Fourmost, Georgie Fame, Dave Dee Dozy Beaky Mick and Tich, Jimmy Savile and Simon Dee. This is an invitation to attend.